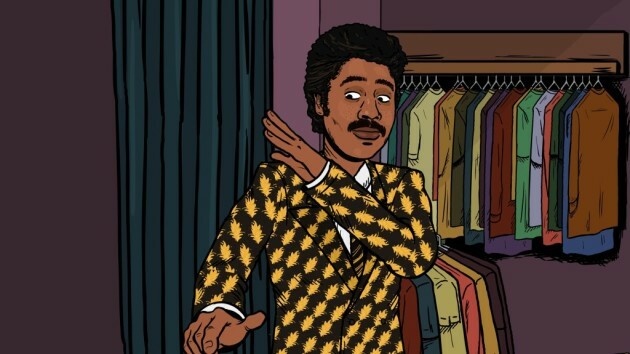 It's Morris Day's time on "Mike Judge Presents: Tales From the Tour Bus." The Cinemax series, which animates behind-the-scenes dirt on classic artists, turns its attention Friday to the charismatic leader of the Time and his rivalry with Prince. The half-hour episode, narrated by Judge, looks back on how Day met Prince, got the inspiration for "The Bird" and rebelled on the set of "Purple Rain." Participants in the revealing, often hilarious documentary include Jimmy Jam, Terry Lewis, local filmmaker Craig Rice, the Time drummer Jellybean Johnson and tour manager Alan Leeds. Day himself pops up to talk about the raucous parties he threw after concerts and chokes back tears when recalling his last meeting with his mentor. The episode airs at 9 p.m. Friday on Cinemax.